Hi Everyone, as you read this I'll be winging my way to Milford Haven on the west coast of Wales ahead of our two day Graphic 45 workshop with Cheryl, In House Interiors and all her lovely ladies. Am hoping the traffic is all coming back into England and I get there in under 4 hours lol!!!! I thought I'd share some crafty inspiration with you and how I made this bright and cheery tag from one of the new PaperArtsy stamp plates. I can't quite make up my mind whether I was drawn to it because of the colours on the packaging or the challenge of fussy cutting out the fabulous feature flower stamp. 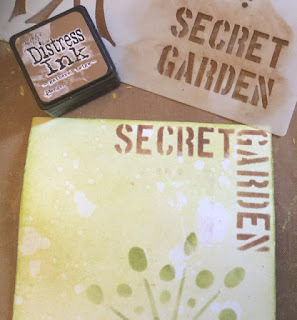 There are so many creative possibilities with stamping, maybe create some unique printing with a gelli plate I went for a tag for starters but am thinking I may have to do a page in my journal too. Here's how it came together if you fancy making one yourself. For supplies see the list at the end of the post. 1. 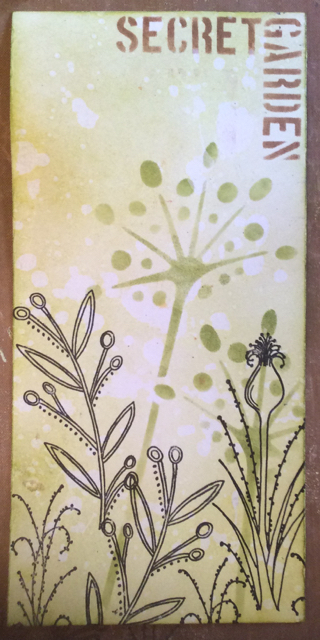 On an 8" x 4" piece of white card use an ink duster and distress inks to colour your background. 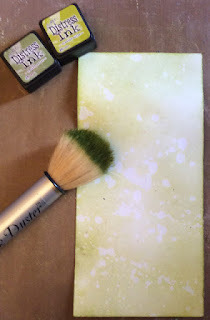 Splash with water and dab off with a paper towel to create a mottle effect. Then use a stencil, distress ink and cut & dry foam to add background images. 2. Edge tag in brown ink and words using a stencil, Gathered Twigs Distress Ink and Cut & Dry foam. 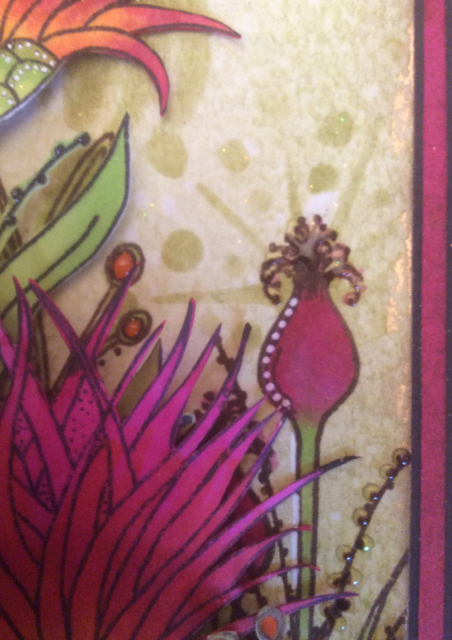 Stamp leaf detail on lower section of the tag using a selections of small stamps and black Archival ink. 3. 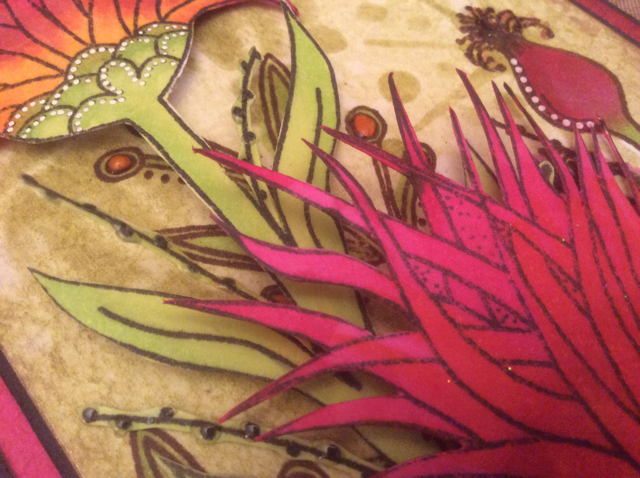 Using distress pens or markers add colour to your leaves and flowers. Use a white Sharpie to add some white dots along the stems too. 4. 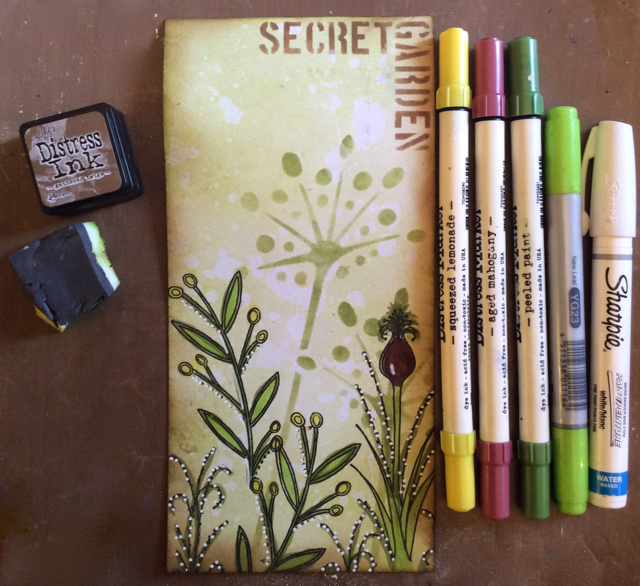 To create the fabulous feature flower use markers or paints and a little water for blending to create a graded background. 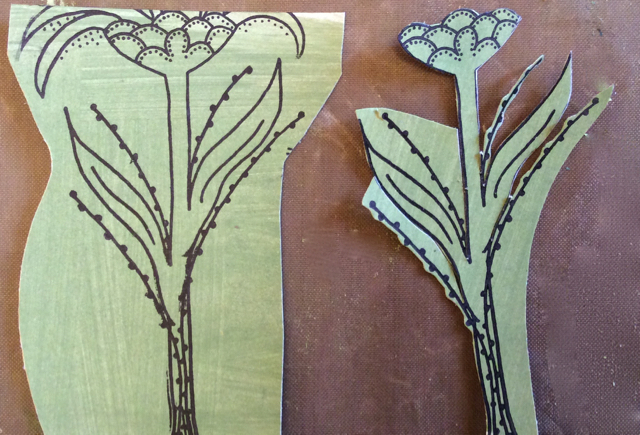 Stamp flower head(s) using black Archival ink and cut out. 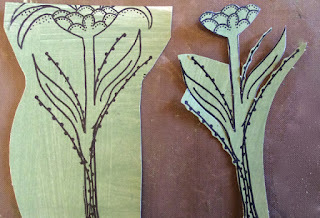 Colour cut outs on reverse with gathered twigs to remove the white edges from the flower heads. 5. 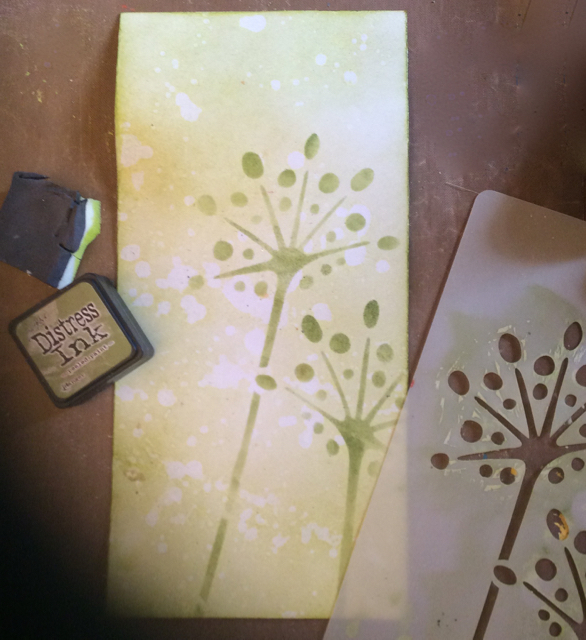 Paint some offcuts of white card in Tinned Peas and stamp out stalk detail and other elements you may want to add to your tag. Cut out. Join flower heads to stalks with a little tacky glue. To create longer stalks add two stamped images together with a little glue. they're sitting use foam pads to hold them in place and tacky glue on your stalks. Finish of with some more white dots, a little glossy accents over the words and round pompom flower heads and a little glitter if you want to add a hint of sparkle to your project too. 7. 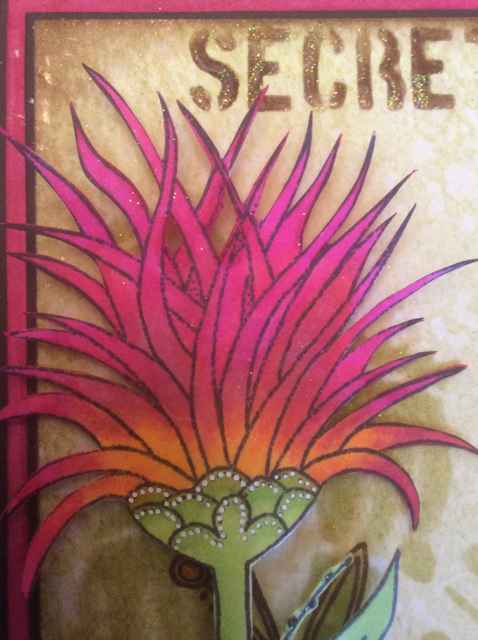 Mount on a layer of black card, then white card coloured in pink paint/pen and a final black layer to create a frame to show off your tag. Not the biggest Paper Artsy fan I must admit - but this is lovely, beautiful colours. 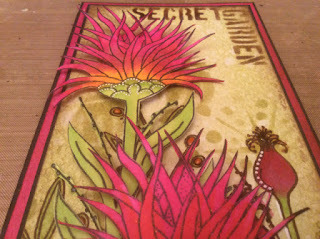 Very cool, good tip on how to achieve the color on the flower!!! Thanks as always Clare!! Have a great time in Wales, drive safe. Hi Clare, Wow !! Wow !! Wow !! I always love everything you create with the Paper Artsy stamps, you have such a 'vision', this card is gorgeous, thanks for the tutorial. Safe journey there and back and have a great time there. 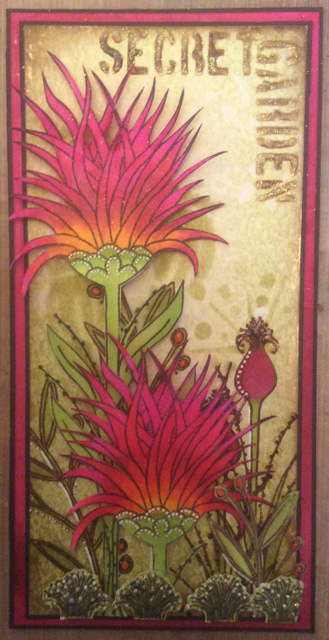 Beautiful work Clare love the colors chosen.